VSFileEncrypt is an easy to use file encryption program. You can encrypt any file you choose. To access the file again, you would need access to the password that was used while encrypting. VSFileEncrypt is a serious solution, but at the same time is easy to use and does not require any technical background - just select any file and choose 'Encrypt' - or simply drag the file to the proper editor box. VSFileEncrypt supports a variety of symmetric-key encryption algorithms, including Sosemanuk-128, Sosemanuk-192, Sosemanuk-256, Salsa20-128, Salsa20-256, XSalsa20, AES-128, AES-192, AES-256, RC6-128, RC6-192, RC6-256, RC6-384, RC6-512, MARS-128, MARS-192, MARS-256, MARS-384, MARS-448, Twofish-128, Twofish-192, Twofish-256, Serpent-128, Serpent-192, Serpent-256, CAST-128, CAST-256, DES_EDE3, Camellia-128, Camellia-192, Camellia-256, RC5-128, RC5-192, RC5-256, RC5-384, RC5-512, Blowfish-128, Blowfish-192, Blowfish-256, Blowfish-384, Blowfish-448, SHACAL2-128, SHACAL2-192, SHACAL2-256, SHACAL2-384, SHACAL2-512. Some encryption algorithms are available only in the premium version of VSFileEncrypt (Windows, Mac OS). See additional information on www.lokibit.com to get premium version. On Linux all encryption algorithms are available. VSFileEncrypt is a native desktop application. This program was developed for Windows (Windows 10/8/7/Vista 32-bit and 64-bit, Windows XP is not supported), Mac OS, Linux (Ubuntu 64-bit). This program encrypts files in the same way on different operating systems. 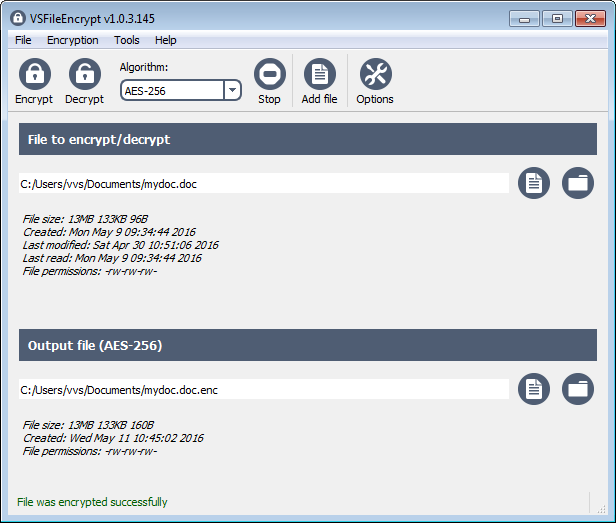 For example, all files encrypted on Windows can be decrypted on Linux and Mac OS. This site does not contain serial number, crack, keygen VSFileEncrypt serial number : serial number is the simplest type of crack. A serial number(cdkey,product key,etc) is register the program as you may already know. a crack or keygen may contain harmful software. If you cannot find the exact version you want, just give it a try. for more information read .nfo/.txt/.diz file include in zipped file.